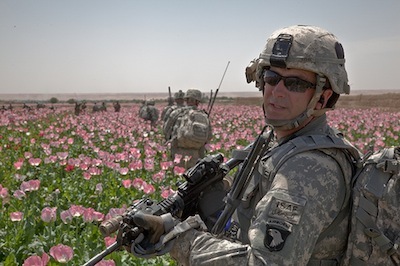 Since the United States invaded Afghanistan, the country’s number one cash crop, opium, has repeatedly broken production records for the country. By some estimates, the occupied territory now supplies by some 90 percent of the world’s poppies. So far, eradication efforts have merely fueled the Taliban’s coffers and driven civilian farmers further outside of U.S. influence. Because of this, the United States has formed a new strategy in the fight against the crop: They are giving up. “The Western policies against the opium crop, the poppy crop, have been a failure,” said Richard Holbrooke, America’s envoy to Afghanistan and Pakistan, speaking to a G8 conference on Afghanistan. “They did not result in any damage to the Taliban, but they put farmers out of work. We are not going to support crop eradication. We’re going to phase it out,” he told Reuters. This week the 64th British soldier to die in Afghanistan, Corporal Mike Gilyeat, was buried. All the right things were said about this brave soldier, just as, on current trends, they will be said about one or more of his colleagues who follow him next week. The alarming escalation of the casualty rate among British soldiers in Afghanistan - up to ten per cent - led to discussion this week on whether it could be fairly compared to casualty rates in the Second World War. "There Are Indications That Public Representatives And Officials Are Involved In The (Drug) Business"
KABUL: Delegates at a joint Pak-Afghan peace jirga last week evinced a keen interest to solve problems facing the two neighbours - including drug trafficking. Recommendations by the fourth of five working committees underlined the need to purge Afghanistan of drugs and the Taliban insurgency and to expand the Afghanistan government’s writ beyond Kabul, officials said. The committee acknowledged Pakistan’s efforts to make the country drugs-free. It asked Kabul to follow the Islamabad way of achieving success against drugs. In a country flooded with narcotics traffickers and corrupt government officials, one of Afghanistan’s few remaining ‘clean’ governors, Mohammed Daud, has been removed from his position, and many are blaming the drug mafia and the CIA for his abrupt dismissal. Daud was appointed at the request of the British government in order to oversee Helmand province, the country’s largest opium producing region. The former and now possibly future governor of Helmand, Sher Muhammad Akhunzada, whom Daud replaced earlier this year, has been widely implicated in the drug trade. Contrary to Akhunzada, “British officials regarded Mr Daud as the cleanest governor in Afghanistan and hoped that his extensive experience in development would help to win over Helmand’s population,” The Times reported. Last month, however, the British government expressed frustration with the effort, pointing to the fact that Afghan President Hamid Karzai continued to meet with the former governor, Akhunzada. Adding further strain on the situation, Karzai appointed Akhunzada as a Senator and made his brother, Amir Muhammad Akhundzada, Daud's deputy. "The president is undermining his own governor," one British official told The Times. "It doesn’t help what we’re trying to do." It would appear U.S. officials, particularly from the Central Intelligence Agency, were influencing Karzai’s actions, undercutting the efforts of their British counterparts. Moreover, as The Independent reported, “British sources have blamed pressure from the CIA for President Hamid Karzai's decision to dismiss Mohammed Daud as governor".